ANDROBOT robots have not been manufactured for years. The company was in the robot business for only a few years. In that time they made quite a mark on the Personal robot scene. Even though you may never get a chance to see an Androbot in person you can read about all the interesting things they could (or were supposed to) do. If you know of any of these robots sitting around collecting dust or parts for these robots (In any condition), Please let me know! I can use any parts I can find for them. It is time. The Year 1 A.B. opens a new era in technological history – a dream that has engaged man’s imagination for centuries. ANDROBOT, INC. Chairman of the Board of Androbot, Inc. was Nolan Bushnell, who founded Atari and the Pizza Time Theater restaurant chain. 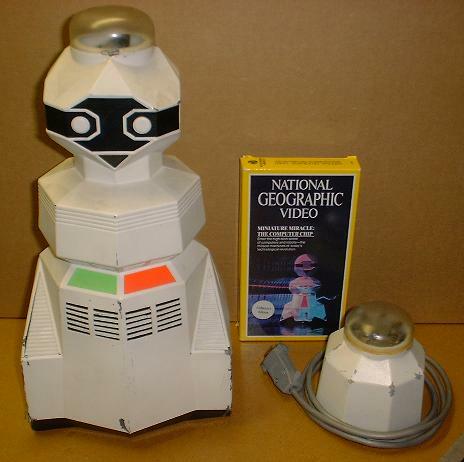 Androbot, Inc.’s original robots (Topo and B.O.B.) were designed to provide entertainment and education. As Androbot’s promotional brochure says: “A personal robot – as we see it at Androbot – should be play-oriented, rather than work oriented. Not an appliance, but a friend.” Androbot made an AndroWagon which easily attaches to B.O.B’s midsection, and enables it to transport books, beverages, or the baby’s diapers from room to room. It was constructed of the same durable plastic material used for B.O.B. and Topo’s body shells. Other software and accessories that were under development include an AndroSentry home security/alarm package, and AndroFridge. If you have more information about Androbot, please e-mail me and I can add it to the page. This 12 inch robot is controlled by a joystick via an infrared signal and moves about a three dimensional playing surface while the game action occurs on a video screen. The Androman is a supplement to the game. Two areas of action exist, one on the television screen and one on Androman’s three-dimentional playing surface. The robot came with a game cartridge, a set of game pieces imprinted with coded information, and a manual. There are two different scenarios of game play: the monitor screen and Androman’s “domain.” First, you have to accumulate a number of points by playing the video game, then you must guide Androman around his 3-D landscape to intercept coded game pieces which activate a different type of game play. Androman can even speak to the player, congratulating him, or warning him of danger. I’ve been told that there may have only been 5 or 6 hand built prototype Androman robots built. One of them is pictured above and shown with a standard VHS video tape to show the size. The custom I/R pod is pretty unique in that it plugged into one of the Atari 2600 Joystick ports. Apparently the joystick ports on the 2600 could also be configured as outputs so it was able to control that IR pod and in turn the robot. 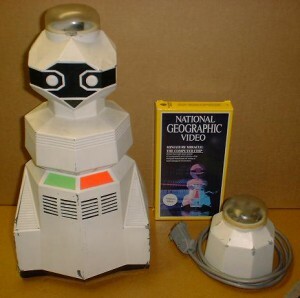 At least one game “Androman on the Moon” was written for the robot. If there were any others they’ve never turned up. F.R.E.D. (Friendly Robotic Educational Device), a small-sized robot targeted for the 6 to 14 age group. The robot is compact and sturdy. When placed on a tabletop or other flat surface, F.R.E.D. can be programmed to perform any series of movements without tipping off, since its mechanical sensors automatically tell it to avoid dangerous edges. Place a sheet of paper or white poster board under F.R.E.D. and, using its drawing-pen attachment, this Androbot can execute precise renditions of complex geometric shapes designed on the computer screen. Packaged with F.R.E.D. will be a mini AndroWagon, enabling him to transport small items from room to room. Planned options, including an accessory arm, will provide F.R.E.D. with additional abilities and function. F.R.E.D.’s design allows for expansion via future software, such as a voice synthesizer for speech programmable by the user. 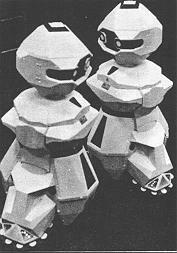 All of the TOPO robots had an ABS plastic body (vacuum formed) and a steel base. TOPO stands 36 1/2 inches tall. It was designed to be a mobile extension of the home computer, which actually serves as its brains and memory. 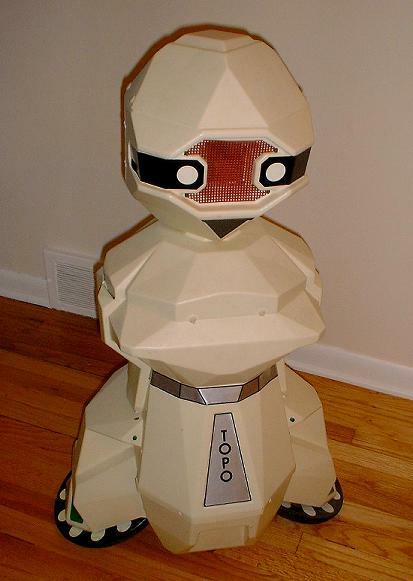 Aiming at educational markets, Androbot began selling TOPO in April 1983. 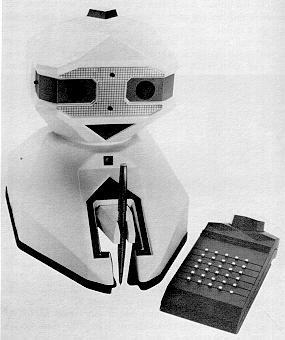 The TOPO I robot used a one way RF remote control from an Apple II+ computer system. It could be driven around with a joystick or have the movements pre-programmed. To program the movements you would either use Apple BASIC and call the driver to make the TOPO move or use LOGO and the TOPO Logo extensions. It had no speech or feedback to the computer. Although very cute in appearance it wasn’t much more than a large remote controlled toy. Since the control interface is modeled from a standard 27Mhz AM RC radio it is possible to customize a standard RC dual stick controller on the same frequency to use it for controlling TOPO. The TOPO II & III were much improved. Designed to interface with most popular personal computers (serial port) via a bi-directional IR (infrared) communications link the TOPO II & III could send feedback to the host computer. This I/R link could actually control several TOPO II/III robots at once! 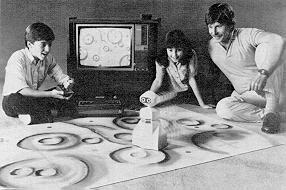 These later TOPO robots added capabilities for text-to-speech talking and movement which made it a tool for parents and teachers to encourage children to sit at the keyboard and learn to program. Androbot switched from BASIC programming in favor of the FORTH programming language. Challenging interactive educational games which have TOPO posing questions and rewarding answers verbally or by performing a playful routine – are one major category of programmable software possible. They were also supposed to be upgradeable via an internal “bus” system which allowed for future upgrades. The only difference I can find between the TOPO II and the TOPO III is that the TOPO III has a different body with a somewhat smaller head. The TOPO III body is made from only 4 panels which saved money on labor to trim each panel and assemble. The most advanced Androbot robots were called BOB (Brains on Board) The first version was supposed to have dual 8086 microprocessors and 3MB of memory. It was a very ambitions project and was ahead of its time. 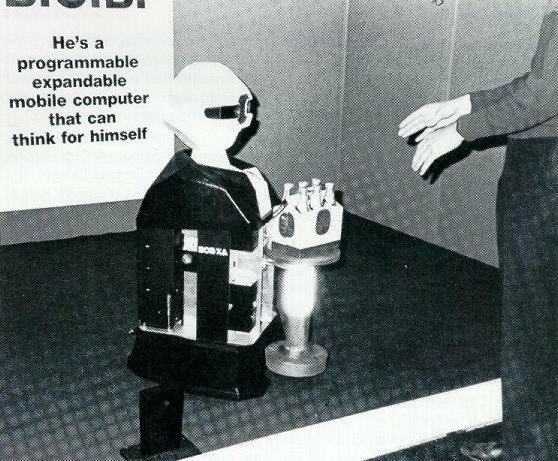 While some companies were having trouble just making a stationary computer with a single processor Androbot tried to go beyond that and make a high end portable one that could interact with the world around it. I have heard that they never worked quite right and that getting both microprocessors to work together caused a lot of problems. These also had unique body panels that allowed the front and rear panels to be easily removed to access the boards inside. The second version had extra sensors to help detect people. I believe this one had a single 8086 microprocessor and a multitasking OS. 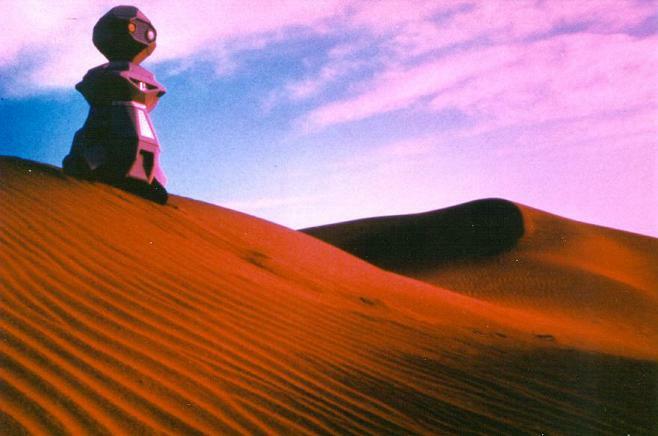 Programming was done in an Androbot customized version of FORTH. This version seemed to use the standard front/rear body panels like the TOPO robots except that it had additional lights in the chest. One of the engineers that worked at Androbot once told me that the heat sensor was a bit too sensitive and could tell the difference between a white and black filing cabinet and could mistake one for a person. Androbot had some great ideas for these robots but they didn’t stay in business long enough to see them through. 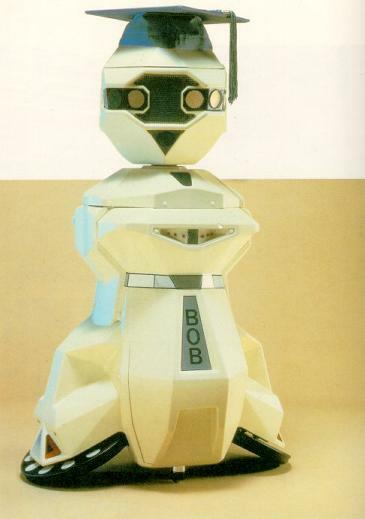 This was the last version of the BOB robot and it was designed and built during the last 6 months of the company before it went under. It used a custom designed XT motherboard with a special ECHO speech card for the voice. I had heard that there was a severe shortage of parts at that time so many of the previous BOB prototype may have been cannibalized for parts to build up a few of these last robots. It has an interesting modular design where the owner could just add on more sensor pods and easily connect them with modular cables. It was also programed in Androbot FORTH. 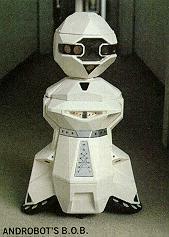 It would be great to find any technical notes or documentation that still may exist out there for this particular robot. Some other interesting projects included a special version of a TOPO with a built-in vacuum underneath. Androbot also experimented with other colors like blue, red, brown, and even some clear robots! Soon we heard a whirring noise and turned around just in time to see an honest-to-God three-foot-tall beige robot get stuck in the shag carpeting and make a sound like a car spinning its wheels on a sheet of ice.